ISLAMABAD: The China-Pakistan Economic Corridor (CPEC) will usher in an era of unprecedented prosperity without saddling Pakistan’s economy with expensive debt, Chinese Foreign Minister Wang Yi said on Saturday. Rejecting criticism over CPEC projects, he said that both Pakistan and China had agreed to re-prioritise project benefits. “CPEC has not inflicted a debt burden on Pakistan … when these projects are completed and enter into operation, they will unleash huge economic benefits … creating considerable returns for Pakistan’s economy,” Wang said at a news conference. Wang, who is also a state councillor, is visiting the country in the wake of US Secretary of State Mike Pompeo’s visit to Pakistan. Beijing has pledged $57 billion for CPEC projects in the shape of soft-term loans and investments. Some CPEC projects have already been completed and the programme is set to enter into its second phase. Whether China is overburdening Pakistan with debt has become a sore point for both nations, who insist that loans are sustainable. In July this year, Pompeo had warned against any bailout package doled out by the International Monetary Fund (IMF) for Pakistan’s troubled economy, saying that the international lender should not provide Pakistan with money to repay Chinese lenders. Wang said that CPEC projects had helped increase Pakistan’s economic growth between one and two per cent, besides creating 70,000 new jobs. Wang, who was accompanied by Minister for Foreign Affairs Shah Mehmood Qureshi, said that 47 per cent of Pakistan’s debt stemmed from the IMF and the Asian Development Bank (ADB). He said that nine of 22 operational CPEC projects had been completed, netting in an investment of $19 billion. He also rejected concerns about CPEC projects’ transparency, insisting that such worries were “false” as all projects had been initiated after securing necessary approvals. Qureshi said that the new government assigned the highest priority to CPEC, adding that both governments would focus on projects which helped boost socio-economic development. “They will be considering projects that have a livelihood connection to them, which means job creation. He (the Chinese foreign minister) has spoken about initiatives in health and education (sectors and) vocational training … making our people more productive for boosting exports,” Qureshi said. Earlier, Qureshi and his Chinese counterpart met at the Ministry of Foreign Affairs for high-level talks. Subsequently, both officials held an in-depth discussion on the entire spectrum of bilateral relationship, including economic cooperation, CPEC, defence cooperation and cultural and educational cooperation. “While reaffirming the ‘all-weather strategic cooperative partnership’ between the two countries, Mr Wang Yi underlined that Pakistan will always be a priority for China in its foreign policy,” according to a statement issued by the Foreign Office. Reiterating that Pakistan was China’s ‘iron brother’, Wang said that bilateral partnership between the two countries served as an anchor for regional peace and stability. China, he said, would work with Pakistan to prioritise CPEC projects to benefit all regions of Pakistan. Reaffirming the strategic cooperative partnership between the two countries, Qureshi said that regardless of political changes, the bilateral relationship would remain as strong as ever. Highlighting CPEC’s significance for Pakistan’s socio-economic development, Qureshi stressed that it would always remain a national priority for Pakistan. Both sides agreed that socio-economic development would always be a crucial area under CPEC cooperation. Meanwhile, the Chinese delegation, led by Wang, called on Chief of Army Staff (COAS) General Qamar Javed Bajwa. Matters relating to regional security and bilateral cooperation were discussed during the meeting, ISPR, the media wing of the armed forces, stated. The Chinese foreign minister said that Pakistan-China relationship was based on convergence of views and mutual respect. 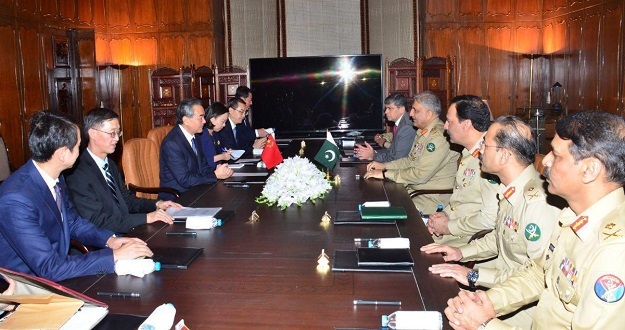 Appreciating Pakistan Army’s professionalism, the Chinese foreign minister said that the world should acknowledge Pakistan’s efforts for regional peace and stability. Appreciating security provided to CPEC project, he said that China believed in “inclusive prosperity”. The COAS thanked the Chinese foreign minister for his visit and continued Chinese support to Pakistan. He complained that Pakistan had suffered because of global wrangling but “we are poised to claim our rightful place in the comity of nations through commitment to peace and stability both within and without”. The Chinese foreign minister also met National Assembly Speaker Asad Qaiser. Terming CPEC a game-changer project for regional development, he said that the materialisation of CPEC was the manifestation of the shared dream of unprecedented prosperity for our region. “We are focused … and committed for the completion of CPEC projects” the speaker said. Describing relations with China the bedrock of Pakistan’s foreign policy, he said that Pakistan and China were committed to an all-encompassing and enduring partnership to support each other at international and regional forums. Wang asserted that Pakistan had an unrivalled importance in China’s strategic calculations. He said that leaders of both countries had demonstrated unflinching resolve to further strengthen bilateral relations. Endorsing the speaker’s proposal for cementing inter-parliamentary relations, the Chinese foreign minister expressed the confidence in the progress of people-to-people contacts between both the countries. He also said that China would continue to support Pakistan in technology, infrastructure development and exploration of renewable energy resources.